The alternative minimum tax was introduced in the Tax Reform Act in 1969 and was intended to prevent people with very high incomes from using special tax benefits to pay little or no tax. The alternative minimum tax is an extra tax some people have to pay on top of their regular income tax. The AMT tax often increases both your marginal and average tax rates. Who is affected by the alternative minimum tax? Basically almost anyone can get hit by the alternative minimum tax AMT, but people with income over $75,000 and some large deductions are often affected by the alternative minimum tax. Taxpayers with capital gains, children, mortgage interest deductions, high state and local taxes, and incentive stock options are especially vulnerable. What is bad about the alternative minimum tax AMT? The problem with the alternative minimum tax AMT is that it has increased its reach dramatically over the past decades. The alternative minimum tax applies today to many people who do not really have very high income in today's standards or who do not claim many special tax benefits. While in 1970 only 19,000 people owed the alternative minimum tax AMT, millions are paying it now. The reach of the alternative minimum tax AMT is increasing because of inflation. While the tax brackets used to calculate tax on ordinary income, exemptions, and also standard deductions are adjusted every year for inflation, the alternative minimum tax AMT brackets and exemptions are not adjusted. Because these tax features are fixed while incomes grow, more and more new people enter the alternative minimum tax AMT zone each year. Where do I calculate and report the alternative minimum tax? The alternative minimum tax is its own tax system with its own rules for deductions, and the best way to figure out whether you owe any alternative minimum tax is to fill out the IRS Form 6251. The alternative minimum tax AMT rules and deductions are quite confusing and usually less generous than the regular income taxation rules. The alternative minimum tax figure that you get from the Form 6251 is entered on page 2 of Form 1040. If you are eligible for alternative minimum tax credit, you will also need to fill out the IRS Form 8801 Credit for Prior Year Minimum Tax. How does alternative minimum tax ATM work? The alternative minimum tax AMT works in a way that you take your regular taxable income and add back some tax deductions and income exclusions to get your alternative minimum taxable income. When calculating the alternative minimum tax, you have to your personal and dependent deductions. Then, you also have to add back your standard deduction in case you do not itemize deductions. The next step is to add your state, local, and foreign income and property-tax write-offs. The alternative minimum tax AMT also does not allow some itemized deductions that the regular tax system does allow. These include investment expenses, some medical and dental expenses, and employee business expenses. Interest from some tax-exempt government bonds is treated as taxable under the alternative minimum tax. Is there anything positive about the alternative minimum tax? One thing is easier here. While the regular tax system works with personal deductions and standard deductions, the alternative minimum tax system uses one huge deduction called the alternative minimum tax AMT exemption. It was $44,350 for single and $66,250 for joint filers in the 2007 tax year. This exemption is deducted from the alternative minimum tax base. There is one catch to this exemption though. If you make over $150,000 then this exemption is reduced by 25 cents for each dollar of AMT taxable income above $112,500 for singles and $150,000 for couples. Note, none of these deductions and exemptions is adjusted for inflation which is one reason why more people owe the alternative minimum tax AMT every year. What is the tax rate that applies under the alternative minimum tax system? After you adjust your income and take all the alternative minimum tax rules into account, the result is subject to the alternative minimum tax AMT tax rate. The alternative minimum tax rates are different from the regular tax rates. See for example the tax rates schedule for 2008 to compare. The alternative minimum tax rate is a flat tax rate of 28% on adjusted gross income over $175,000 plus 26% of amounts less than $175,000 minus an exemption depending on filing status. Again, these alternative minimum tax AMT brackets are not adjusted for inflation which causes much greater exposure to the tax as the years go by. If the alternative minimum tax AMT is greater than your tax calculated using the regular rules, then you have to pay the greater amount. What happens if I do not calculate my alternative minimum tax? 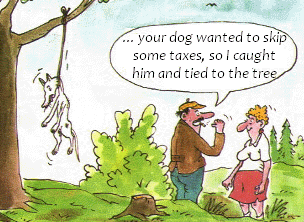 If you get audited by IRS and it turns out that you should have paid the AMT, IRS will recalculate your taxes and charge you with back taxes plus any interest or penalty that the IRS decides to impose on you. It is advised very much not to skip the alternative minimum tax AMT calculation. Anyone with income above $75,000 and capital gains, business loss, incentive stock options, write-offs for personal exemptions, taxes, home-equity loan interest, and other major adjustments should be concerned. If you own a business, rental properties, partnership interests, you should also be aware. If you earn more than $100,000, you are almost certainly subject to the alternative minimum tax. Can I just simply choose between the regular and AMT tax? The tax system is constructed in a way that you must do all of the paperwork for a regular tax return and then all of the paperwork for the alternative minimum tax. It is because the definitions of taxable income, deductible expenses, and exemptions differ in the alternative minimum tax system from those on Form 1040. When you find out that you got hit by the alternative minimum tax, you also must recalculate all your carryforwards since the AMT carryforwards are different from the regular tax carryforwards. Once you qualify for the alternative minimum tax AMT, you have to file AMT versions of carryforward losses and alternative minimum tax AMT carryforward credits until they are used up in future years. How can I avoid alternative minimum tax? One way to avoid alternative minimum tax is to have a simple tax return, simply said. That means having fewer alternative minimum tax AMT preferences which translates into having less state income taxes, real estate taxes, less mortgage interest, less itemized deductions (forget about expensing your computer [section 179 tax deduction]) and so on in any given year. Another way to avoid AMT liability is to stay out of the $75,000 to $415,000 income range. For example if you are thinking about exercising your stock options, depending on your circumstances, it might be better to realize a $1 million capital gain all in one year rather than dividing it into two or three years. If you owe alternative minimum tax AMT, charitable deductions and home mortgage interest may reduce your tax liability. They are treated a bit better under alternative minimum tax than under the regular tax. Where can I get some help with the alternative minimum tax? First, you can ask questions in our tax discussion forum. Then you can check the links below. And once you have your alternative minumum tax calculated, do not forget to check our last-minute checklist for error-free tax return.